Used as far back as the thirteenth century, the Port of Amsterdam is ranked as the number 4 port in Europe, handling almost 93 million metric tons of cargo annually, employing directly (and indirectly through port-related companies) 55,000 people. 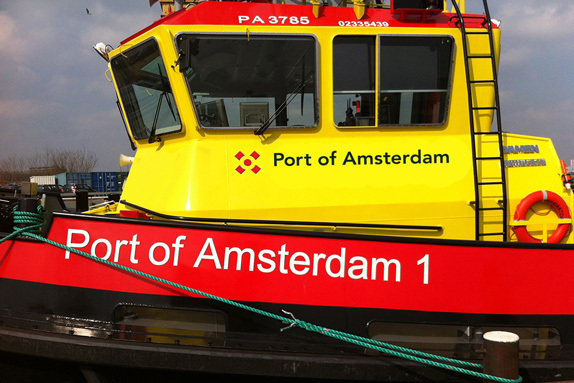 The Port’s main goal, besides moving stuff, is “stimulating economic activity and employment in the entire Amsterdam port region.” Previously owned and managed by the local government, this April the port was established as an independent, corporate entity with the City of Amsterdam as the main shareholder and a new logo was introduced, designed by Groningen, the Netherlands-based Hole in the Dyke. The logo for the new Port Company is based on two forms - the circle and the (Andreas) Cross. The eye is ‘forced’ to see the form of the circle which is actually not there. The logo reflects the contrast between new and well-known; between open and closed; between looking inwards or looking outwards. New logo introduction video. Probably the most charming, funniest (if not, at least, pun-iest) introduction video in a while. When I was first looking up this story I thought the old logo was the new, since it feels fresh, stylish, and minimal in that sophisticated-yet-slightly-edgy European way — I mean, who wouldn’t want a client to accept a logo with three bold Xs? The new logo manages to go even more minimal and still maintain a little bit of that edge by summarizing the three Xs into one with a Gestaltenish circle at its center. Bold, simple, port-like (if there is such a thing as logos that feel like ports). While it’s usually pretty to have a lot of colorful color variations, this logo doesn’t benefit at all from them as it takes away from the starkness of the mark and in application, as seen in the banners above the boat photo, the identity falls flat — and it’s too bad the nice patterns developed didn’t find (or haven’t found) a way into the application. As nice as the logo is, though, the best part about this whole project is the pun-firing Patricia (directly above). Used as far back as the thirteenth century, the Port of Amsterdam is ranked as the number 4 port in Europe, handling almost 93 million metric tons of cargo annually, employing directly (and indirectly through port-related companies) 55,000 people. 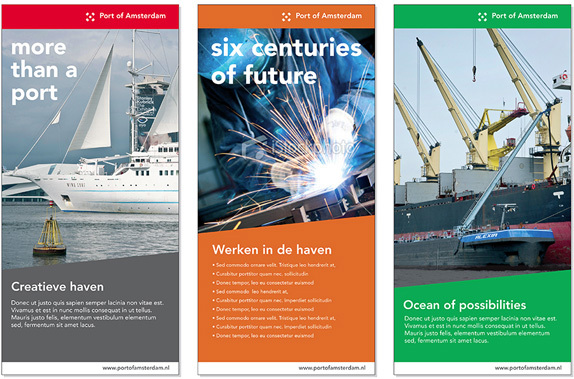 The Port's main goal, besides moving stuff, is \"stimulating economic activity and employment in the entire Amsterdam port region.\" Previously owned and managed by the local government, this April the port was established as an independent, corporate entity with the City of Amsterdam as the main shareholder and a new logo was introduced, designed by Groningen, the Netherlands-based Hole in the Dyke.